Its rival, BMW X5 offers even better handling and driving experience. Have a question on XC90? XC90 is available in 7 different colors - Grey Metallic, Blue Metallic, Crystal White Pearl, Osmium Metallic, Bronze, Ice White and Bright Silver Metallic. Watch latest video reviews of Volvo XC90 to know about its interiors, exteriors, performance, mileage and more. Volvo XC90 is a luxury crossover produced by Swedish auto makers that was first introduced at the Detroit Motor Show in 2002. Based on the Volvo P2 platform, the car is currently Volvo's largest selling vehicle in USA. Over the years the car has been bestowed with several accolades and has garnered an overwhelming public response throughout the world, much credit for which goes to its high power and performance, sleek design and advanced safety and infotainment features. The Volvo is set to launch the 2nd generation XC90 in August 2015 which will come with even more advanced engines and additional comfort features. The aesthetics of the car will give you a love at first sight feel. The low sporty front, the new link between the stylish headlights and the wide elegant grille is captivating. The captivating exterior connotes athleticism and dynamism at first sight. The aerodynamic side profile coupled with a dynamic rear gives the car rich panache. Moreover a large wheelbase makes provision for plenty of cabin space inside. There are copious of modern gadgets installed inside the car which will definitely fantasize tech savvy customers. Along with the numerous modern gadgetries, there are plentiful of comfort and safety equipments like lane change indicators, adaptive lights, provision for emergency call and so on which ensure an overwhelming driving experience. Volvo XC90 is available in variants powered by a 2.4 litre diesel engine and a 3.2 litre petrol engine. The base variant can churn out a maximum power of 120 kW at 4000 rpm along with a peak torque of 340 Nm between 1750 to 3000 rpm. Move up to the advanced 3.2 litre petrol engine and you will get a praiseworthy power of 179 kW at 6400 rpm and a peak torque of 320 Nm at 3200 rpm. The Swedish engineers haven't compromised high power and performance with the safety of passengers and have equipped the car with copious of safety features which are more than enough to keep you and your vehicle safe. The Swedish automakers have designed the interiors in such a way that aggrandizes the driving experience along with a supreme comfort and is a perfect amalgamation of modern design and ample cabin space, thanks to the use high grade materials and consummate finish throughout the cabin. Balance and contemporary touch are the crux of this executive crossover. Every corner has been optimally utilized and the passenger compartment has been ergonomically designed in a way that gives easy access to all the control functions on the dashboard. The high grade upholstery along with the seats fabricated with soft leather adds to the elegance inside. Ergonomically finished seats and upholstery makes the car a winner. All the functions have been ergonomically placed and are within the riders' reach. The fully adjustable seats have been provided with heating elements that enhances the thermal comfort of the passengers. The car has been provided with Electronic Climate Control that maintains the cabin temperature according to your choice and can be set independently for the driver and the passenger. LED interior illumination with 7 individual settings has been provided which further enhances the interior ambiance. Plenty of storage compartments, including the cup holders at the front and the rear, have been provided for the passengers to store their knick knacks in. A large wheelbase makes the car quite spacious and makes provision for ample of cabin space inside. Volvo XC90 offers a boot space of 530-litres and this figure increases manifold with the rear seats folded down. This segment is the quintessence of the car. Just one look at the dashboard and you will get dazzled by the advanced equipments and features provided. The car has been equipped with the advanced Premium Sound Audio System that boasts 12 high-end loudspeakers and creates a true concert hall experience. The rear seat entertainment has been offered which comes with two 8-inch widescreen displays incorporated at the back of the front seats and wireless headphones which takes the traveling experience to a higher level. At the centre of the instrument panel lies the advanced GPS based RTI navigation system which can provide voice guidelines and graphic navigation all the way to your destination. 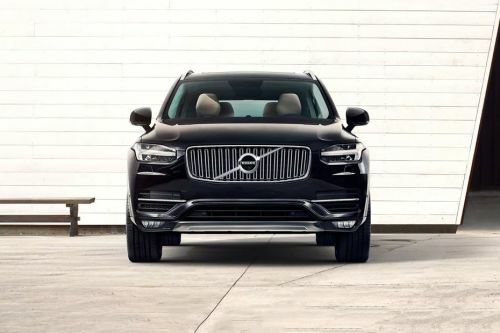 Volvo XC90 is a perfect paradigm of a dynamic machine that blends high power with elegant appearance. The car is available in numerous dynamic exterior body color designs that gives you a fair discretion. The front bumper bar, the chrome finished exquisite tailpipe and the elegant roof rails look captivating. The aerodynamic side profile in harmonics with the sporty rear gives the car a touch of sophistication. The cynosure of attraction is the gracefully crafted trademark Volvo R-design grille which adds to the overall aesthetics of the car. The R-design stainless steel side scuff plate along with the alluring LED daytime running lights gives the car an air of charisma. XC90 is quite an imposing crossover which is quite evident from its dimensions that stand out to be 4807 mm x 1936 mm x 1784 mm (L x W x H) and the wheelbase of the car measures 2857 mm which makes provisions for ample of legroom and cabin space inside. Volvo XC90 is implanted comes employed with a wide range of alloy wheels of size 17 inch, 18 inch, 19 inch and 20 inch available in many alluring designs that exude dynamism even when the car is standing still. The car has been equipped with the innovative Start & Stop technology which automatically shuts the engine off during small stops and can restart the same within microseconds which automatically results in a superior fuel economy. In terms of fuel economy, the most impressive engine is the 5 cylinder 2.4-litre diesel engine which can deliver a mileage of 12.3 kmpl. The advanced engines deployed in Volvo XC90 are designed to elevate your driving experience to new levels of harmony and comfort. Depending on your driving style and situation, the intake valve train automatically switches between economy and performance modes to optimize efficiency and also results in reduced CO2 emissions. The car is deployed with 3 powerful engines, the most impressive among all the engines in terms of power being the 3.2 litre 6-cylinder petrol engine can punch out a maximum power of 179 kW at 6400 rpm coupled with a peak torque of 320 Nm at 3200 rpm. The 2.4 litre 5-cylinder turbodiesel engine can churn out a maximum power of 120 kW at 4000 rpm alongwith a peak torque of 340 Nm between 1750 to 3000 rpm. The 2.4 litre 5-cylinder turbo charged diesel engine can churn out a maximum power of 147 kW at 3900 rpm alongwith a peak torque of 420 Nm between 1900 to 2800 rpm. The 3.2 litre 6-cylinder petrol engine can churn out a maximum power of 179 kW at 6400 rpm alongwith a peak torque of 320 Nm at 3200 rpm. Volvo XC90 is not a car which you can unleash on a race track but still the car picks up number quite efficiently. The base variant can dispatch 0-100 km/hr in 11.8 seconds. For more exhilaration, you can choose the 3.2 litre 6-cylinder petrol engine which can reach the same mark in 9.5 seconds which is appreciable for a vehicle of this segment. The agile handling offered by Volvo XC90 is the result of advanced all wheel drive technology which works in harmonics with Instant Traction to help increase driving stability and traction on all road surfaces. The Four- C active chassis provides a choice of three different driving modes which enables simultaneously adjusting each shock absorber to maintain optimal handling. The Swedish manufacturers have kept in mind maximum safety and security of the passengers and have embedded the car with copious safety features. The car has been embedded with optimally positioned dual stage airbags that ensures maximum safety of passengers in case of any inadvertent collision. The car has been equipped with the advanced City Safety System which automatically stops the car at speed upto 50 km/hr in case of an emergency situation. The Anti Lock Breaking System works in harmonics with the Electronic Stability Program to deliver a superior adhesion on wet terrains. Besides these, the car has been incorporated with several other safety features like Roll Stability Control, Warning Triangle, Side Impact Protection System, safety belts with pre-tensioners, collapsible steering column and so on which ensure maximum safety of the riders. What is the price of Volvo XC90? On road prices of Volvo XC90 in starts from AED257,250 for base variant T5 Momentum, while the top spec variant T6 Excellence costs at AED438,900 . What are the colors options available in Volvo XC90?